The Put-in-Bay Poolview Condos provide spacious accommodations, plenty of amenities, and a fun, refreshing pool at the center of the complex. Read on to learn more, or make a reservation now! Located next to the Waterfront Condos, the condos are on 500 feet of lake shore property. Vacationing on Put-in-Bay is made any more special by close proximity to Lake Erie. Sunsets over the water and cool lake breezes are just some of perks of being close to the lake. Each condo can sleep up to eight guests with two bedrooms, two baths, and a full kitchen. Whether you vacation with your family or a group of your closest friends, these condos feel spacious and cozy. The kitchen is fully equipped, making it easy to dine in or prepare lunch to take on the boat. The pool area features picnic tables and chaise lounges, a lovely place to start the day with a cup of coffee. There are also propane grills available for use. Guests are more than welcomed to bring their own drinks to the pool. The pool itself is spacious and refreshing. Kids love playing in the water while adults lounge by the pool, working on tans. Feel safe and secure with coded entry to all condos. 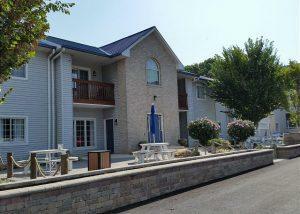 The Put-in-Bay Poolview Condos are located a mile and a half from downtown Put-in-Bay. The entire island is full fun and interesting things to do. Families enjoy exploring the island, from the ruins of the Hotel Victory to Perry’s cave where there is a rare underground lake. Outdoor activities abound from parasailing to kayaking and of course fishing on Lake Erie. The most celebrated fish caught are the perch and walleye. Not a fisher? There are plenty of restaurants that serve these fish up right. Try the tropical take at The Keys or classic hand-breaded baskets at the Upper Deck. Goat Soup & Whiskey cook up incredible perch tacos. There’s no end of bars and nightclubs on the island. Live music spills out onto the street and everyone has an amazing time during summers on Put-in-Bay.